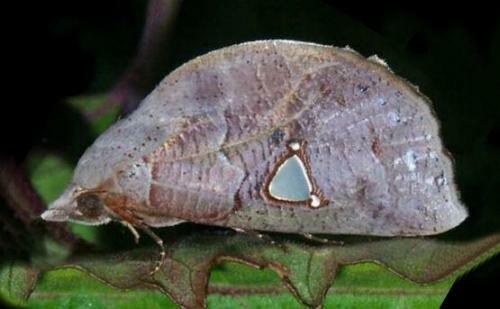 The adult moths of this species are brown with a white triangular spot halfway along the costa of each forewing. The hindwings are brown, shading to black at the margins. The males have rounded forewing margins, but the females have a cusp on the forewing margins. Volume 8 (1976), p. 28. LeapFrogOz, Kuranda, 2015, p. 170. CSIRO Publishing, 2007, p. 25.